For small business purposes, it is important to note that S corporations are generally recommended over C corporations because of the differences in tax filing requirements. C corporations make up the majority of publicly traded companies and considered as separate taxable entities and file corporate tax returns with Form 1120, where the corporation is required to report its income and expenses in order to claim its deductions and credits. As a result, the profits of a C corporation may be subject to double taxation – the corporation as well as the shareholder must also pay taxes on dividends paid by the corporation. In contrast, S corporations are not subject to corporate income taxes. Instead, S corporations file Form 1120S. S Corporations are considered as pass-through entities because the profits and losses for the corporation are recorded via Schedule K-1 on the shareholders’ income tax returns. Most income and expenses also are reported via Schedule K-1. Pros. An S corporation will allow you to treat yourself as an employee of the corporation so that you can pay yourself a salary while treating the rest of the money that you earn as a Rideshare driver as distributions from the corporation (and thus pay a lower tax on the distribution amount). Using an S corporation also gives you the protection of treating your business as a separate entity from your personal assets. If the business is sued, your personal assets will generally be protected. These are only the requirements from the IRS and additional filings may be required by the states in which your S corporation is recognized. Additionally, the IRS requires that you pay yourself a salary of a “reasonable” amount, which is determined by several factors, such as your industry. If you opt to ignore this requirement and take all of your earnings as dividends, the IRS may decide to re-characterize these payments as salary and send the corporation a bill for unpaid employment taxes. You may also still be held personally liable for any damages in any lawsuit or criminal proceeding where it can be proven that there was negligence on your part, such as in the case of a drunk passenger or accident resulting in injuries to the passenger due to your failure to repair a broken part on your vehicle. However, tort cases are not the only instances where you could be held personally liable for damages. A court may make the decision to “pierce the corporate veil,” which is the legal decision to treat the rights or duties of a corporation as the rights or liabilities of its shareholders. Piercing the corporate veil is a decision that is determined by the court. However, the court may consider several factors in making this decision, such as whether the shareholders failed to follow the reporting rules of the business entity or failed to adequately maintain the corporate records. In other cases, the shareholders could be held liable personally if the court determines that the shareholders have mishandled or manipulated the assets or liabilities of the business. LLCs are great for small business owners because they provide the liability protection of a corporation, however, for tax purposes your business will be considered as a pass-through entity, which means that the business itself is not subject to income tax. Rather, the owner(s) of the business are taxed individually on the entity’s income. LLC owners must report income earned from the Rideshare Platforms on their personal tax return. ●For a single-member LLC, the taxpayer is required to file a form 1040 and a Schedule C. These are the same requirements as a sole proprietorship. ●For partners that maintain a multimember LLC, Form 1065, U.S. Return of Partnership Income must be filed. Cons. One important thing to note is that the personal liability protection that is offered by an LLC does not generally matter in the event of a tort/negligence claim, as in the case of an S corporation. There are also some specific ongoing filling requirements for LLCs. For example, in California, LLC’s must file a Statement of Information on a biennial basis. The fee is $20 for this statement. California also charges LLCs a minimum franchise tax of $800, which is due annually. When it comes to insurance, whether you form an LLC or a corporation for your business will not matter as much during the period in which you are transporting a passenger because you will generally be covered by the Rideshare platforms insurance. However, problems can arise when you factor in the time while you are waiting for an Uber request, before the passenger enters the vehicle and after the passenger has left the vehicle. A personal car insurance policy may not offer coverage for these issues and you may need to obtain a commercial policy. As of right now, there are only a limited number of insurance companies that offer policies to deal with these insurance gaps. Scheduling a consultation with a qualified insurance agent from a reputable company is the best way to obtain guidance on these issues. If you are still confused about the best way to manage your Rideshare business, we can help. 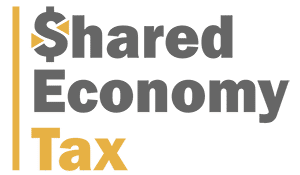 Contact Shared Economy CPA for more information.